The free open source Kodi software is mainly designed for home entertainment. Kodi was created for Xbox media center and continued to bring in the latest update for Chromecast and other digital devices. The constant modification has stimulated more downloads and love for the dynamic application. In 2003, Kodi came up with above 200 translations through more than 500 software developers. In other words, you could customize the add-on features at Kodi with absolutely no cost. The application was not only supportable on a laptop but also work on Amazon fire TV and Smartphones. Kodi allows the user to enjoy podcasts, music and videos and much more. It supports MP3, WMA, Wav, and versions of music for an enjoyable experience. Also, it can help the main video formats along with importing and playing the available movies for free. The TV show library absolutely supports seasons and episodes under the banners and Posters for keeping an over on track of your progress. What all can Kodi let you do? The Smartphone, tablet and computer application is an excellent add-on to everything. It allows the users to access worldwide content through the wide range of features it has. Till date, Amazon fire TV stick is the best and the most affordable wireless Kodi streaming device. Kodi is the application that is stimulated a love for media amongst users. The entertainment hub comes with the dynamic, user-friendly package and 100% free customizable features. Earlier, Kodi was known as XBMC and has been an award-winning open source software media player that can be installed in Android, OS X, Linux, and other Android devices that teacher 10 – foot user interface. All iOS users must check the article on “How to Install Kodi on iPhone/iPad Without Jailbreak, No PC and Without xCode“. The multifunctional application is downloadable on almost any operating system and digital device. It can be used in Linux, Android and Windows operating system. In fact, you can also download it in microcomputer Raspberry Pi. For the ones who have iOS devices, the process is slightly complicated. This article shall tell you how to install more than one Kodi build on your MI box Android box from a fire stick, NVidia Shield, and fire TV. The Kodi clone application lets you add on is each Kodi on each device. It is really a fun affair if you have multiple Kodi builds running on the same device. Before going through this tutorial, it is essential for the users to determine the exact storage space of your streaming device. In case of fire TV stick, you can know the same by visiting settings -> device -> about -> storage. The same steps have to be followed in order to find the overall storage available on other TV boxes and Android TV sets. Some of the Kodi builds need at least 500 MB to 1 GB of storage space for convenient installation and workability. So you need to ensure that your saving box has at least this amount of space to manage the installation of multiple Kodi builds in a single device. Mac users must give a try on this perfect complete guide on “Way to Sideload iOS Apps on Mac using xCode 7 for Free Without Jailbreak“. First, you need to go with the installation process of Downloader. Downloader is a cost-free application available at firestick App Store. For the ones using MI box or Android TV box get downloader from official apps store and install downloader browser to enable browser within the downloader application. Launch the browser within downloader and visit http://repo.supremebuilds.com/. This particular Repo address is used for installation of Supreme build wizard within Kodi. You can use the same address for accessing various Kodi forks at the same time. Check out forks folder. 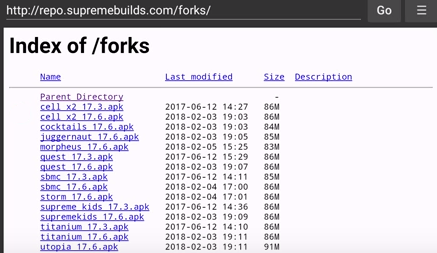 Every fork folder brings with .apk files. With hundreds of Kodi build are available i.e. etc. check out the best Kodi build for your device. Kodi users should always remain connected with VPN protect their privacy and identity during online streaming. Use IPVanish for concealing the identity and to get the best possible experience. Error Fix Article: How to Fix Failed to Install a Dependency Error in Kodi[Quick Guide]. Updated News: Update Kodi on FireStick, Fire TV & Android TV Box (Update 2018). Besides everything, Kodi lets you record and watch TV from different media interface through next PVR, MediaPortal, myth TV and TV headend. Skins in Kodi device let you alter the app appearance entirely. You will certainly find something or the other that perfectly matches up with your taste. If you are looking for the installation process, then you can follow the above instruction further. 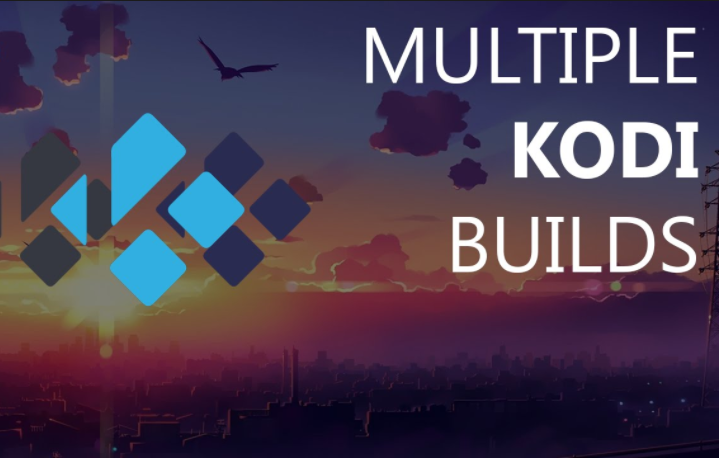 We have completed our article on “Installing multiple Kodi Builds” with utmost sincerity. It should be repo.supremebuilds.com don’t forget the S at the end of Build. Hi, You are absolutely right. Thanks for informing us. Now, we have been updated the post with the updated link :).